A very silly story about an alien that convinces Steve Lombard that they're brothers in order to steal Steve's athletic prowess. I'm not even kidding a little. 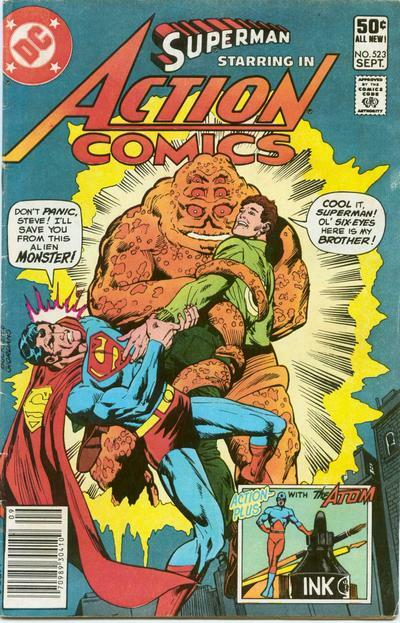 As I noted a couple of days ago, Superman faces some very, very strange menaces. I think it's because most writers recognize that if they used the kinds of challenges that are usual for other superheroes, Superman would fix the problem immediately. But when you go to the stranger side of things, antagonists can have very weird and specific powers that baffle, but never quite defeat, the Man of Steel.